Newport Bay Conservancy conducts an Environmental Education Program out of the Newport Aquatic Center for high school and college students. 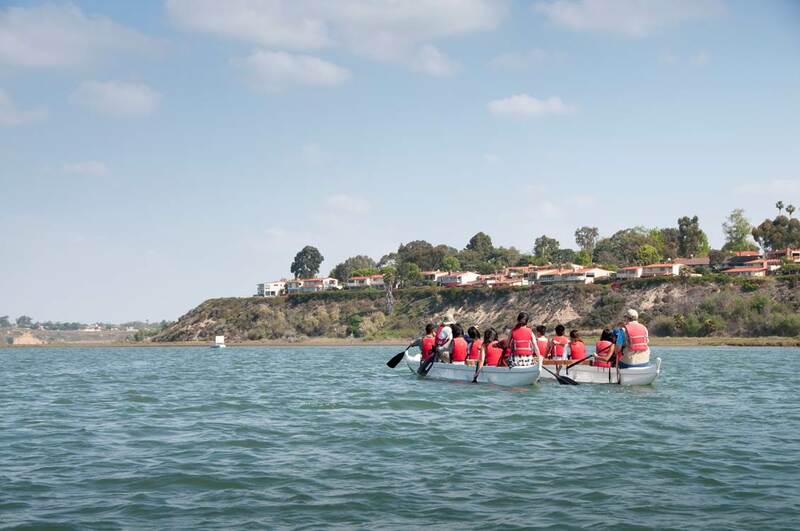 Students spend a couple hours on the water in an outrigger learning about the Bay and frequent winged visitors and a couple hours on land learning about plants and the different habitats of the Upper Newport Bay. Last year, over 1,200 students from 18 different schools participated. For more information, contact Carissa Macias, Program Coordinator at carissa.macias@newportbay.org or 949-923-2269. The Back Bay Science Center (BBSC) on Shellmaker Island is dedicated to educating students and public about our coastal resources, especially Upper Newport Bay. With few exceptions, BBSC focuses on 7th through 12th grade students for school programs. California Department of Fish & Wildlife staff, with the help of volunteers and interns, lead several hands-on activities focusing on topics like plankton, mud organisms, birds, and water quality. With BBSC’s twelve new lesson plan activities, teachers have the ability to modify these field trips to connect to topics learned in the classroom. There is no cost for the programs but schools must pay for their own transportation. If interested, please fill out a Facility Use Request Form and send it to Joanne Park, Education Specialist, at robin.madrid@wildlife.ca.gov or call 949-640-9956.